Chances are distressingly high that an American undergraduate—even one attending an elite institution—will be taught mostly by overworked and underpaid adjunct professors and graduate students who have received no teacher training and whose careers are haunted by the “publish or perish” ethos of modern Academe. This may suit the university’s bottom line, but does it really constitute a quality education for their students? 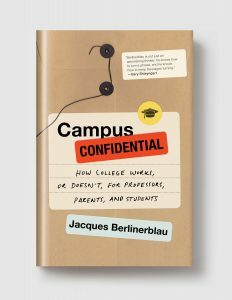 Campus Confidential is an irreverent and incisive professor’s-eye view on college today, in which Jacques Berlinerblau tells us what so many professors are thinking but so few are saying. From a close look at this new professoriate and how to get the best out of it, to learning how to survive bare-knuckle interdepartmental politics, to valuable tips on how to evaluate and apply to colleges in the first place, Berlinerblau offers a master class on how colleges can operate and improve themselves, and how potential students and their parents can make an informed decision on which to attend. JACQUES BERLINERBLAU is a Professor and the Director of the Center for Jewish Civilization at the Edmund A. Walsh School of Foreign Service at Georgetown University. His work has appeared in the Washington Post, the Nation, and the Chronicle of Higher Education, and he has appeared on CNN, PBS, CBS, NPR. and elsewhere. His most recent book was How to be Secular. Read his posts on MobyLives!